Here is an almost unique Used Auto-Sleeper Broadway EB ES 4 Berth 2015 model. 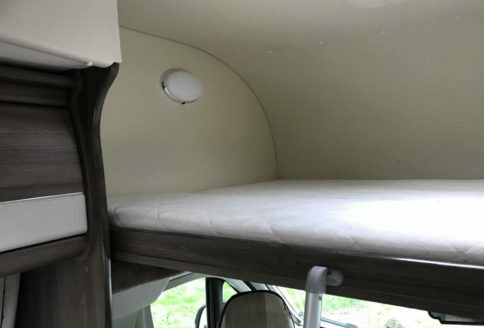 At only 6.2 meters long, this “Luton” style, coach-built 4 berth Auto-Sleeper is going to prove a popular model. 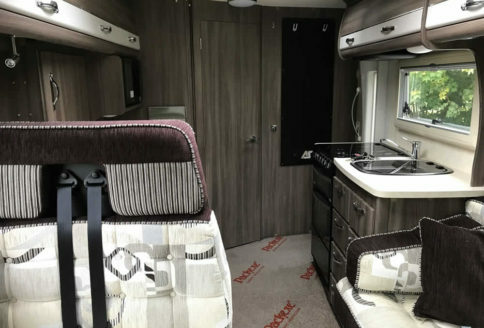 The Broadway EB ES (end bathroom, extra seating/sleeping) is a medium wheel-base model built on a Peugeot Boxer chassis. 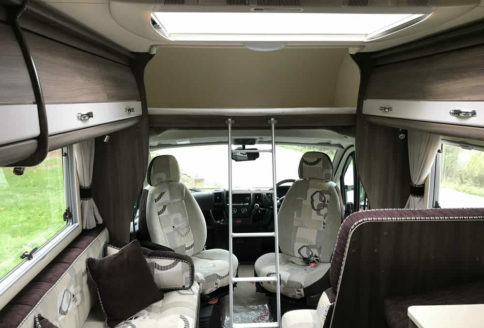 Thus, as a 4 berth, it is ideal for families not requiring a super-large coach-built or for couples simply needing occasional extra seating and sleeping. This Broadway was sold from new by us and has also been serviced by us too; it has had 2 local owners and was registered in July 2015. It has covered just 15,850 miles. The ever-popular Broadway range has a very impressive specification and our Broadway ES EB is no different. Hence, it HAS Peugeot’s 2.2 turbo diesel engine with their 6-speed manual gear-box too. The cab features air conditioning and cruise control as well as electric windows and a radio-cd player. 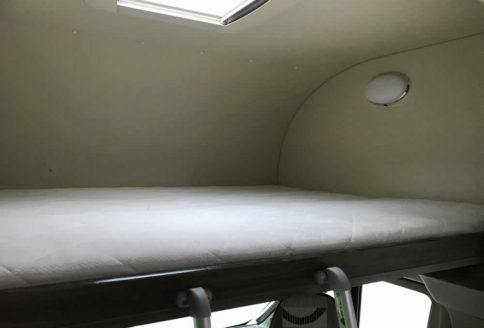 The habitation (living space) features an over-cab double bed, double forward-facing travel seats, a chassis-mounted and refillable gas tank, a roof mounted solar panel, a really great bathroom and very comprehensive kitchen. Our Broadway features lots of driver and cab specification. As standard there are driver and passenger air-bags, electric windows and mirrors and there’s also a colour reversing camera too. There is cruise control, an adjustable steering column and there’s a good music system too. Above the cab is a large Luton-style double bed with hinged lift-up section for ease of entry and exit to the cab seating. Finally, the cab features removeable carpets, sliding blinds, swivelling cab seats with arm rests and also height adjustment and lumbar adjustment too. 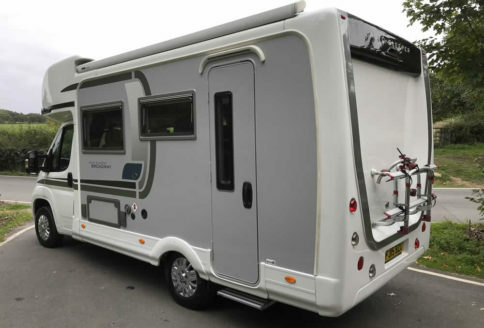 Our Used Auto-Sleeper Broadway EB ES 4 Berth 2015 has a great, living specification. The kitchen is very good and features just about everything a cook could want. 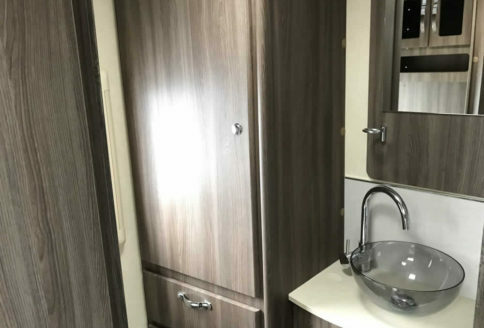 Highlights include a full-size cooker with 3 gas burners and 1 electric hot-plate as well as a microwave oven and large fridge with freezer compartment. Above the cooker is an electric cooker hood and useful storage lockers, drawers and cupboards both above and below the work-top. 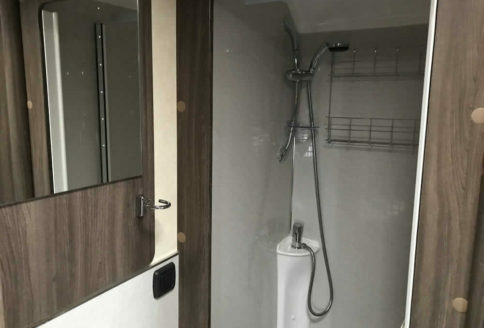 To the rear of the motor home is the shower room and toilet. This is a great space and incorporates a wardrobe with drawers below, a feature sink unit and separate shower cubicle. The toilet is a cassette style with electric flush. Heating the Broadway is via “Truma’s” combi, gas or electric warm-air heating and hot water boiler system. 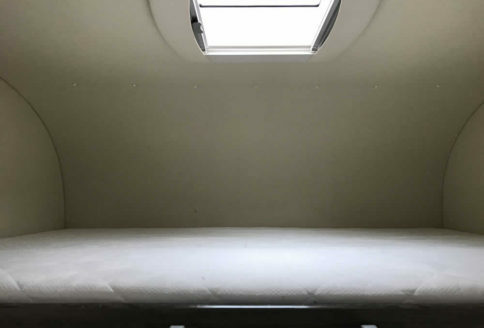 This system ducts warm air into the living space and shower room. Finally, the lounge, featuring a sofa behind the cab passenger seat and double, forward-facing travel seat opposite. The lounge features swivelling cab seats for extra comfort and when turned around the lounge becomes a great place to entertain. Sleeping is easy, there’s the adult-sized double bed over the cab or the sofa and dinette convert to become a double or singles too. Finally, there is a large, opening roof-light and large lounge windows too allowing light to flood in. Even though our Broadway EB ES is only 6.2 meters long, it isn’t short on storage space. 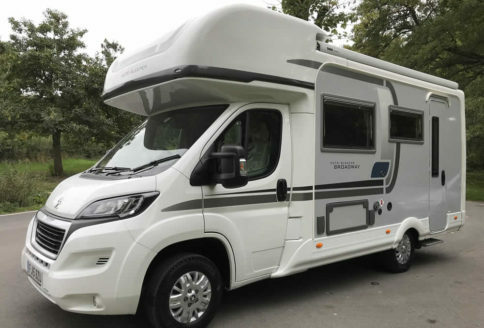 Due to their clever use of a gas-tank, this model has no gas locker and as it also has the over-cab “Luton” style pod too, there’s even more space for storage too. While discussing storage, the near-side sofa base lifts and supports on gas assisted struts for ease of access to the storage space below. Below this sofa and under the floor is a very useful wet-locker, ideal for storing leads, hoses, boots etc. and also outside can be found an external gas bbq point and power socket too. Back inside and there are over-head storage lockers too. Finally, the last remaining features are a small pedestal table (which can be set up for use between the cab seats) as well as the standard, large, free standing table for use inside or outside. There are rear wind-down steadies for stability when parked, an electric door-step and a large wind-out awning to laze under too. On the roof is the solar panel and television aerial. Come and have a look, we welcome part exchanges.